It took Porsche the better part of a decade to complete the inimitable 959: twin-turbo, all-wheel drive and unbelievably fast. 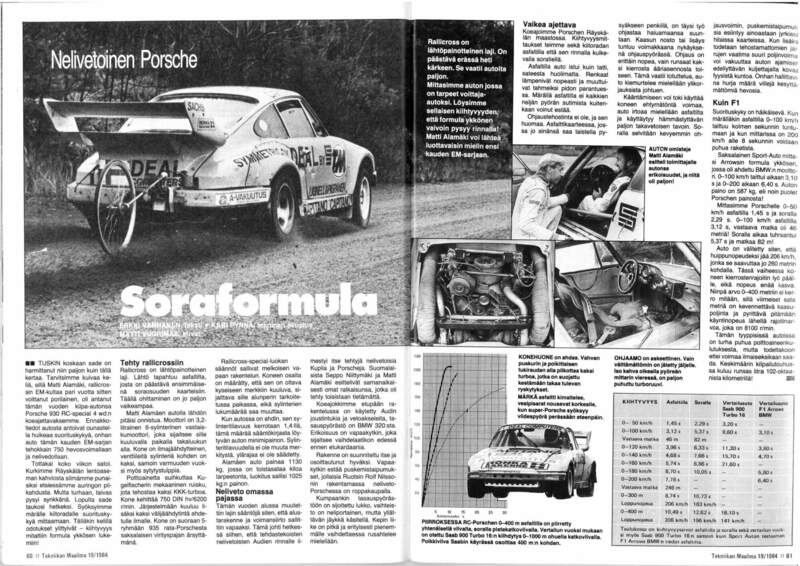 But the company had been beaten to the punch, by a lone Finnish man with a very yellow 911, 4WD and as quick as an F1 car. This is Matti Alamäki’s Porsche rallycross car. It won the 1985 European Rallycross Championship, but that’s not why you love it. You love it because it made 760 horsepower out of its twin-turbo 3.2 liter flat six, and was as quick as an F1 car of its day thanks to a 4WD system. I’m not exaggerating. Finnish auto magazine Tekniikan Maailma tested the outright acceleration of Alamäki’s car in 1984 and had it run 0-62 mph in 3.12 seconds. A scan of that test can be found here. An Arrows F1 car, using BMW’s legendary thousand-horsepower turbo engine, only squeaked to 62 in 3.1, from another test Sport Auto reportedly conducted. 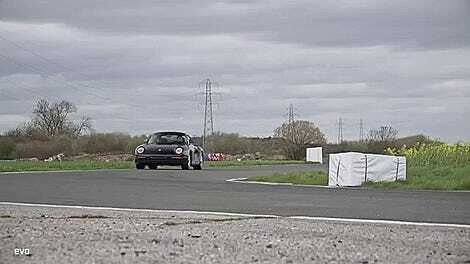 Watch the car absolutely rocket off the line in the wet, and you’ll believe everything about its acceleration figures. A rule change for 1984 in European rallycross meant that teams were allowed to modify the “chassis structure and the power transmission,” as my cobbled-together Google translation of Finnish explains. That’s what allowed Alamäki to fit Audi four-wheel-drive gear to his car and give it its traction advantage. The springs and front driveshafts are Audi, the differential is supposedly from a BMW 320, per Tekniikan Maailma. Alamäki also put some kind of freewheel on the front end, though how that worked is beyond my technical comprehension. That engine ran two KKK turbos and was supposedly out of a Porsche 935 that raced in the Deutsche Rennsport Meisterschaft, the predecessor to today’s DTM. That period was one of massive turbocharging, so the output is far from unbelievable. There are also rumors that Porsche came looking at the car while working on its own 959, but I haven’t found anything to support that, either. Alamäki eventually switched to running a Lancia Delta S4 once all of Group B rally’s cars got banned from stage competition and filtered down to rallycross. 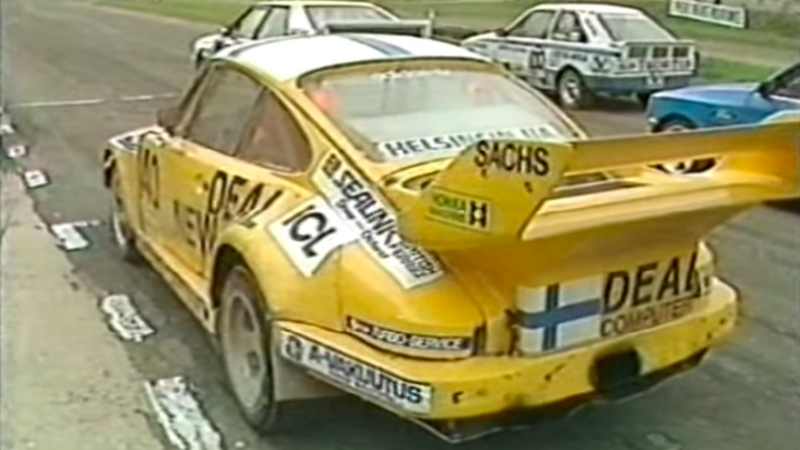 Watch how the Porsche runs in a 1986 arena competition and you’ll see how much more advanced even the now-rough Group B cars look in comparison. Still, I can’t help but adore this rough but wonderful 911, a homebrew special the likes of which are rarely seen.